Five Six Models to choose from. Easier to use and less conspicuous than a nightstick these S&W Batons provide threat deterrence with a quick flick of the wrist. These new telescopic batons from Smith and Wesson are heat treated to enhance their hardness and durability in heavy use. They are law enforcement grade batons, perfect for security detail or self defense. The baton opens with a flick of the wrist for instant deployment when you need it. Closing requires a downward thrust on a hard surface to retract for carrying. The grip is a thick rubber (actually a thermoplastic polyester elastomer) with deep nubs built in for strong retention and excellent, balanced feel. (Better grade manufacturing than the generic batons). Made with tough 4130 steel ally seamless tubing to provide for years of professional use. (Check your local laws for restrictions). Comes with free hardshell sheath that fits on any belt. It is a tough and functional holder that allows you to withdraw the baton with one hand. A vital feature for anyone carrying a baton. Carries Smith and Wesson Limited Lifetime Warranty (Taylor Brands). 1680 Denier shell sheath included, free! 16 inch model: Retracted Length 6.75", 13.6 oz. weight. 24 inch model: Closed 9.25 inches, 18 oz. 26 inch model: Collapsed length 10 inches, 19.3 oz weight. 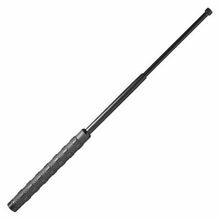 Now available is the Aluminum 26 inch Telescoping Baton. Same S&W quality with a foam handle and aluminum body for easy to carry and light weight. This unit is 9.6 inches closed and weighs a mere 10.3 ounces. Though very lightweight the arc and speed you can produce with this 26 inch baton is considerable and very effective. Comes with a heavy duty 1680 denier belt holder that will fit on your belt or molle webbing. Limited Lifetime Warranty from Manufacturer. Retractable and Telescopic Batons cannot ship to MA,CA,NY,NJ,PA.